Walmart is offering a free sample of Emergen-C vitamin fizzy drink mix. You’ll receive one sample packet each of Multi-Vitamin PLUS Cherry-Pomegranate and Pink Lemonade. I love the Pink Lemonade flavor and it was perfect to take on my recent trip to get some extra Vitamin C and I think it helped me stay healthy while traveling. 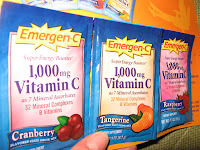 You can also get another free sample of Emergen-C directly from the manufacturer (click on the yellow bubble “Free Samples”). When I got this sample in my mailbox there were 3 packets: Cranberry, Tangerine, and Raspberry and a coupon to Save $1 on any 36 ct. box. Did you know they don't always give the samples when you request them? I've requested them multiple times and have always received an e-mail a few months later with an apology that I wasn't getting one and a coupon. Kind of a bummer. I'm glad there is a Walmart sample because I'd like to try it. Thanks!